• Color: Blue or Silver (default). Please specify. 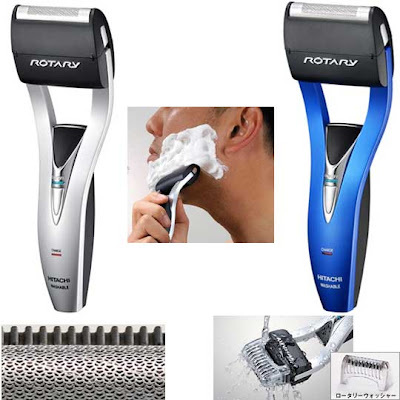 The Hitachi Rotary Razaq is an electric WET shaver that is not only stylish in every way, but gives an amazingly close shave. It’s omni-directional blades get your beard at every angle for perfect smoothness. The blade is completely washable. The Rotary Razaq’s strong motor goes 3,500rpm, so it’s powerful as well. Since it’s waterproof, shaving and both cleaning are simple and can be done in the bath or shower, and the slim, ergonomic grip keeps it from slipping. An amazing razor for any situation, and available only from Japan.